With our two sets of twins, I figure it’s high time I wrote more about the whole twin factor. So occasionally, on Tuesdays (not every Tuesday – I’m not a predictable blogger), I will post a Twinspin. My spin on life with twins. Let me say right up front. I LOVE having twins. Not long after we knew we were having our first set of twins, we were welcomed into this special club. It’s a pretty cool place. Enter and you discover this phenomenal secret. A secret that only those with twins can really understand. I wouldn’t trade our twin life for anything. Our girls are fraternal. Our boys are identical. You can bet we’ll probably be doing a “twins” science fair project some day. Observing the twin gamut as we go along. So I love this picture of Ali and Sami. One day I asked them to put on dance clothes so we could have our own little dance class. This was their attire as they bounded upstairs. Leotards inside out AND backwards. Tights over the top. And dress-up slippers as ballet shoes. I thought they were darling. I especially love the disparity of their body shapes. Look at their arms! 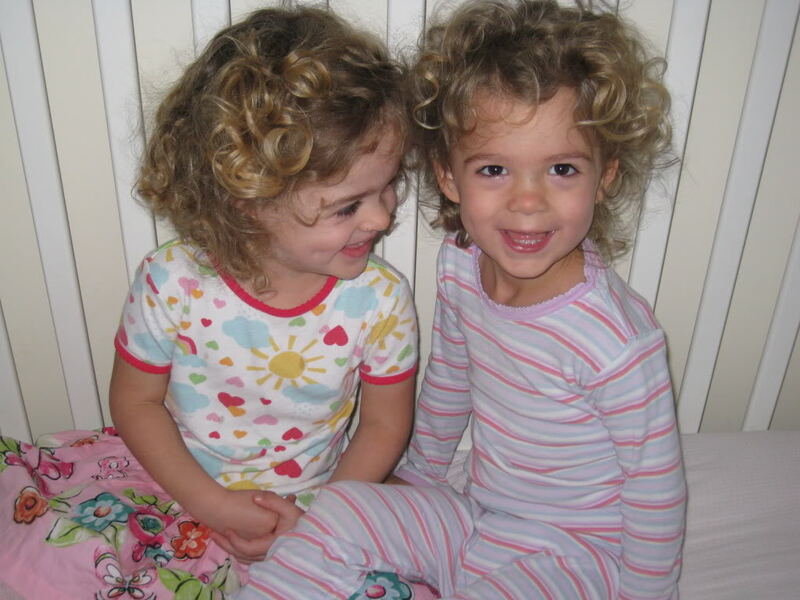 Twins are the same in a few respects, but mostly – they are different. Different from each other. Individual. Unique. And they want you to know it. The delight in having twins is that the joy is multiplied. It proliferates, expands, and swells within you to the point of bursting. Sometimes I’m feeling so much love I’m not sure what to do with it! I still go gaga when giggling with one of my boys, only to glance over and find the other one smiling at me – waiting for his turn. Or when I walk into the room and not one, but TWO boys start bouncing up and down in their exer-saucers, kicking their legs like crazy – so excited to see me. And you can probably guess the flip-side. Challenges are multiplied too. One sick baby always means two in a matter of hours or days. One fussy baby often leads to two fussy babies (misery loves company with twins – not sure why). And crying in stereo. Man. That’s enough to put anyone over the edge! As for the work? I’ve always thought it wasn’t quite double the work. Maybe 1.5 times the work? You’re already preparing food, changing a diaper or bathing one baby. Two is just a little bit more. But as mentioned in plenty of previous posts, it’s the overwhelming feeling that you are outnumbered and under-handed that can make it hard. So today’s Twinspin is about napping. Currently we are dealing with what I call nap annihilation. Sounds destructive? Well, it is. Nap annihilation is the calamitous cessation of a nap due to toddling twins sharing the same room. For nearly three years, naps have been predictable and golden. We’ve paid the “cry it out” price to have five children who put themselves to sleep, sleep all night, sleep through each other’s cry, and nap like champs. But lately, as the girls threaten to drop their blessed afternoon nap, the fact that they simply have each other – is making for serious mischief, loud squawking/singing/yelling, and total bedroom decimation. Annihilating the much worked for and sought after NAP. Right now I have all FOUR twins napping from 2 – 4 PM. Unfortunately this is going to be short lived. Two peas in the same pod. Sami can climb out of her crib. Ali can’t. So where does Sami go? Into Ali’s crib, of course! Usually it’s fun and games. They jump around, tickle each other, pretend to sleep. But one morning – things got a bit rough. Sami suddenly found herself in the lion’s den. Watch and see. Now that Sami has discovered she can’t climb out of Ali’s crib either – she avoids Ali’s lair and begins the ruinous work of room destruction. Ali’s role? Cheerleader and accomplice. She eggs Sami on. They laugh boisterously. Sami hands Ali things to throw and Ali hucks on cue. Last Sunday Sam climbed into the hamper. My Sherlock intuition says she must have struggled to get out. The side-seam was ripped 10 inches and one of the hanging loops was torn off. Several hangers were busted because she pulled so hard trying to get dresses down from the closet. Most drawer contents were dumped onto the floor. The humidifier was spilled. And the back of a picture frame was torn off, the picture inside crumpled. I won’t even begin to list the books that have been chewed to death, the decor (clocks, bookends, bunnies) that have been thrown one too many times, the number of water bottles hurled, and the times Sami has been caught standing ON TOP of the dresser. So we’ve had some talks. Things are a little less cataclysmal. And as parents, we’re swallowing the hard reality that these two are probably ready for big girl beds. As for coping this week, I’ve been sitting IN their bedroom when it’s time to nap, keeping them quiet, and within 10 minutes or so, they’re out cold. Obviously, they still need their naps. But when the two are in cahoots and no adult is on the premise – it’s way too fun to wreak havoc, try acrobatic bouncing on crib mattresses, and scale from various pieces of bedroom furniture. Why sleep? What about you? Have you experienced anything similar? Help? Feel free to share my blog with other parents of multiples. I would love their input. Love to swap ideas. Oh man, I have no idea how to help. I know if Beckham and Carter were in the same room, they'd never sleep. Let me know if you get any brilliant ideas! Your words and thoughts mean even more now for obvious reasons. I loved your last post on "meeting needs". This dilema is usually what brings tears to my eyes when I think about when the twins do come and how I will do reading, homework, volunteering, etc with all my girls. Thanks for sharing your wisdom. I can't wait for when we finally can get together. Brod – Darn. Still no brilliant ideas? Me neither. Em- When your twins come, you will give them exactly what they need. And you will give your girls what they need. Not in the same way as you did before, but you will still give them what they need. One of the surprising joys, is that others (like you did for me!) will step in and help you meet the many needs. We aren't the only ones who can meet ALL of our children's needs. I'm learning we have unmet needs so others can come to our aid, so we can be connected to each other, serve and strengthen each other. I think God intends it to be this way. I'm so excited for you! Can't wait to talk twins… soon!